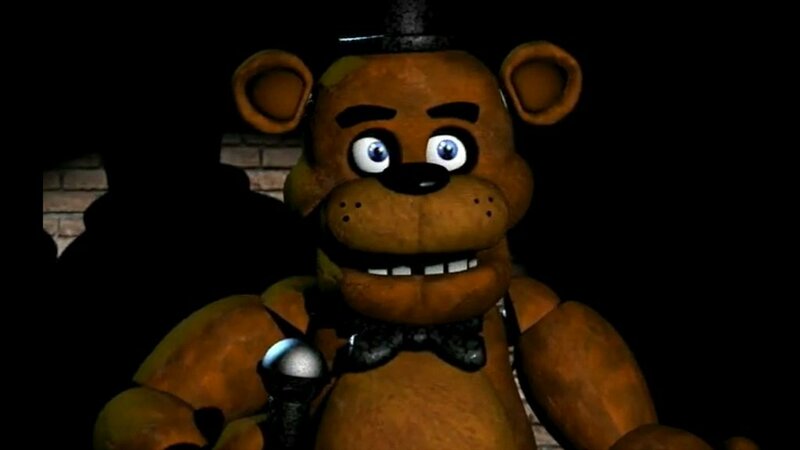 With the recent announcement of both Five Nights at Freddy’s 4 coming out this August and a movie in the works, it is a great time to discuss this rapidly growing series. It seems as if every couple of months, creator Scott Cawthon has been releasing these short, stressful games appeasing fans and theorists alike. While these roughly two hour long experiences work as games, is it possible for it to translate well to a film? According to history, the answer is “no” for the simple fact that there hasn’t been a good video game to movie adaption yet. However, this game has such an interesting lore and simplicity to it that it could be the first good video game movie. The set up of Five Nights at Freddy’s is very simple, which is part of what makes it so good and what will make or break this franchise as a movie. A key to making this work as a movie, is to make the tone a serious horror movie but with comedic elements sprinkled throughout the flick. The set up of haunted animatronics is so silly, it would be weird for there to be absolutely no humor in the movie. However, most of my friends (including me) were scared of the Chuck E. Cheese animatronics growing up, so the humor should be used sporadically in order to keep a consistent tone. To bring the authenticity of the horror, the movie should also be shot in an abandoned Chuck E. Cheese and have the movie be set in the early 1990’s, much like the first game was. That may sound difficult, but from a production standpoint it’s actually not. Shooting in an old Chuck E. Cheese would actually save the production some money since they wouldn’t have to build a set. Even now, productions use abandoned or closing establishments to save money. In fact, recently filmmaker Kevin Smith made a deal to shoot his latest movie, Mallbrats, the sequel to Mallrats, inside a mall that is about to close. Timing is everything when it comes to this, so the hardest part of shooting in an abandoned or closing Chuck E. Cheese is actually finding one. The last two points I made kind of go hand-in-hand considering these steps would have to be taken care of in pre-production. The writer of the movie should definitely follow some of the main stories and themes that were presented in the series of games. However, as anyone who actually played the games will tell you, the lore of the series runs deep and is highly up to the players interpretation. Because of this, the writer should play through the first game and interpret it his or her own way to form the story. To be honest, I’ll be disappointed if the movie turns out to be using mostly fan theories, and if that’s the way it is done, the movie viewers and fans of the games will find the movie to be too predictable. Another danger writing-wise is that the series’ creator, Scott Cawthon, is involved with the production. The writer should listen to what he has to say about the story but also remember that Cawthon is a genius game developer, but that doesn’t necessarily make him a great storyteller or writer. It will be a very dangerous line to walk when scripting this flick. My last point is that this movie shouldn’t cost too much to make. The franchise name will be marketable enough, so no big-named actors really need to be put in this movie from a marketing perspective. The budget of this movie could easily be made for around 5 million dollars with an additional 1-3 million for marketing. As long as a good chunk of the budget goes to building the animatronics, this movie will have money to spare by the end of production. Oren Peli would make a great director for this project considering he knows how to make a low budget horror movie into one of the biggest franchises in the world, like what he did with Paranormal Activity back in 2009. Regardless of what you think about Paranormal Activity, it’s hard to argue that the first movie, which was the only one directed by Peli, is a well-shot and well-paced movie that was made on an insanely small budget and was an astounding success. With the budget being low, this movie should also be fast tracked. The movie should come out when the game is still popular and in the zeitgeist of pop culture. With the fourth game in the series coming out this August and supposedly being the last game in the series, the movie is getting closer to not being able to strike while the iron’s hot. For maximum profit, this movie should be released anytime between April and October 2016 before people stop caring about Five Nights at Freddy’s as a series. This movie has the potential to be the first good video game to movie adaption, it’s now just a matter of if the filmmakers care enough to ensure quality rather than making this a simple cash grab.